All come with a poles and a bag of pegs. We have a selection of shelters. The AE types are suitable for a small patrol, the AG types for a normal sized patrol, the AL types for a large patrol. 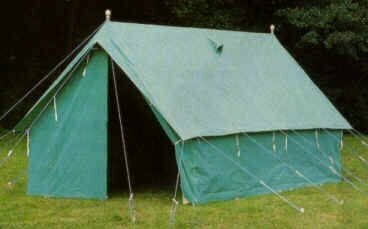 The ‘Brown’ AA is a large, heavy duty tent with many uses. It is now showing its age (the Group had at least one of our ‘Browns’ when I was still a cub many many years ago, and rumour has it our tents saw service in the 2nd World War…) and are normally only lent out for special purposes, complete with flysheet AB. The poles are 7’ long, which can be awkward if you are transporting them in a car. The collapsible set EB is particularly useful if transport space is limited, as they will fit in a largish car.